For weeks we have endured endless chatter about #OscarsSoWhite and how to better increase diversity in Hollywood. Now that the awards season has officially ended and the Academy Awards have been handed out, I can finally give my two cents about this. I watched the Oscars knowing that the acting categories were going to be swept by white actors – after all, only white actors had been nominated. Yet, I could tell that the producers of the show, one of whom was Reginald Hudlin, a black film producer and former BET president, were trying to at least showcase diversity among the chosen presenters. I was happy to see Priyanka Chopra, Lee Byung-Hun and Olivia Munn presenting awards. Diversity was on display in some categories: Mexican filmmaker Alejandro Inarritu won Best Director for The Revenant, Indian-British director Asif Kapadia won for the documentary Amy, Chileans, Gabriel Osorio Vargas and Pato Escala Peirart, won for Best Animated Short, and Pakistani-Canadian filmmaker Sharmeen Obaid-Chinoy won for Best Documentary Short. Ok, so the Oscars were not completely white. But, they came pretty close to being so, and that’s because Hollywood is, itself, exclusionary. The night included comedy bits skewering the lack of black actors in Oscar-nominated films. It was hilarious to see Whoopi Goldberg crashing Jennifer Lawrence’s Joy, Leslie Jones terrorize Leonardo DiCaprio in The Revenant, Tracy Morgan be The Danish Girl, and Chris Rock get left in space as The Martian. The point was well made that black actors rarely get the opportunity to star in these types of movies. Along the same lines, recent studies have shown that only 1% of Hollywood’s leading roles go to Asian American actors. Films like The Martian and Aloha came under fire this past year for failing to cast actors of Asian descent in roles that were originally written as Asian American. Yet, this “whitewashing” of Asian American characters has received scant attention from the industry. I guess it doesn’t matter enough. Many writers – both within and outside the Asian American community – have penned essays critical of two anti-Asian jokes that aired during the Academy Awards ceremony. Few have noted another apparent snub of the Asian and Asian American community on Oscars night. Traditionally, artists nominated in the category of Best Original Song are invited to perform in musical interludes during the awards ceremony. This year, Sam Smith, The Weeknd, and Lady Gaga performed, but not all nominees had been invited to do so. One nominee excluded from performing was South Korean Grammy-winning soprano, Sumi Jo, who had been nominated for an Oscar for “Simple Song #3” from Youth. The more I thought about it the more I became incensed. I’m a music artist who has written music for film too, and I would be offended if I didn’t get the opportunity to perform my song when others did. I get it: the artists chosen to perform at the 2016 Academy Awards were big pop stars. People want to see them. However, for an awards show that’s getting hammered about diversity, the Academy just missed a huge opportunity to showcase some of the diversity of their nominees. Neither Sumi Jo nor Anohni, whose song “Manta Ray” was also considered for Best Song making her only the second trans person nominated for an Academy Award, were given a chance to perform. The lack of recognition for Asians isn’t limited to the Oscars. I’ve been a voting member of The Recording Academy for over a decade now, and I attended the Grammys a few weeks ago. This year one of my songs and album was on the first ballot in six categories for the Grammys. The second ballot is what constitutes the final five nominees in each category. Yet, I was struck by the lack of Asian nominees on the first ballot in mainstream categories, let alone our underrepresentation among the final nominees. Sure, Asian Americans were nominated for (and even won in) less publicized categories like Classical and New Age, but the public only hears and sees the more popular categories. Among those, the most notable Asian American nominee would be Bruno Mars, who is multiracially Filipino American. I was disturbed by some of the conversations I had on the topic of diversity when I attended Grammy related events. A fellow Chinese American artist and musician who tours with a well-known band lamented the fact that people kept getting him and another one of our friends, who is Filipino, confused. He rightfully said “the struggle is real.” My husband, Only Won, is also often mistaken for our friends, despite the fact that he’s a half a foot taller than those other guys. At a Grammy after-party, I was talking with a former BET executive who crowed to me about the diverse music genres he was playing on his new network. Given this as well as his own experiences as a black person in the music industry, I thought he would be receptive to my suggestion that his network play more Asian American artists. He responded that his network’s lineup already included a Korean artist. That was nice to hear, but he seemed to have missed my point. Offering exposure to a single artist does not achieve representation for an entire community, and moreover this executive seems to have forgotten that “Asian” and “Asian American” are not synonymous terms. Too often, the nuances of the Asian American identity are lost in a music industry that stereotypes and overlooks us. Recently, my record label was testing my new dance single, “I Feel Alive.” One DJ saw a photo of me and dismissed my record without even listening to it because he thought I was a K-Pop artist. Never mind, of course, that I’m Chinese American and my music bears nothing in common with K-Pop. Everyone else that heard the record loved it but the fact that many people continue to lump all Asians in one category is highly problematic. I’ve been fortunate to have been part of diverse projects over the years, such as when I hosted a TV show with a racially diverse casts of co-hosts. I used to sing in a group that had black and white members. However, I realize those were exceptions and unfortunately not the rule. Too often, we think about diversity in black and white terms, and in so doing we fail to consider the many artists who fall somewhere in the middle, and whose voices and stories also deserve to be told. I’m not saying people go around purposely and maliciously discriminating against Asians. But, when we find ourselves constantly left out of conversations on media diversity, and not given equal opportunity in film, TV and music, we have no choice but to conclude that we don’t matter in this industry. What’s more: we will continue to not matter until we tell this industry – in undeniable terms – that we do. The Oscars began and ended with Public Enemy’s “Fight the Power”, and maybe it’s time for more of us take up that mantra. It’s time for Asian American artists to remind Hollywood that Asians matter in this industry, too. 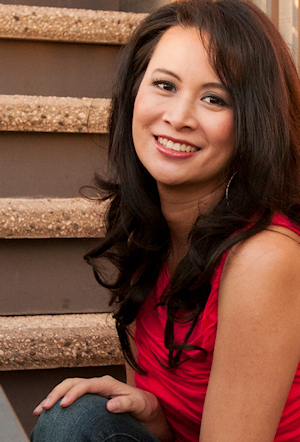 Larissa Lam is an award-winning recording artist, songwriter and filmmaker. She has previously written music for TV shows and networks such as The Oprah Winfrey Show, Dr. Oz, E! and TLC. She has been a guest speaker on diversity in media at numerous universities including Yale, MIT and UCLA. Learn more about Reappropriate’s guest contributor program and submit your own writing here.